Am I the only one having to turn their 5’s into 6’s these last few days? With every year there is change from the start. It begins with the change of a date, but quickly evolves into a chapter of your life where remarkable things happened. Good or bad we accept those things and file them under the four digits of when they happened. With each new four-digit, we come up with a resolution; something we’ll promise ourselves to commit to throughout the year. Sometimes they stick and sometimes they don’t, but I always thought the process of coming up with a goal for the year was better than even following through with it. I used to think; she vowed to not eat meat this year. That’s noble. People love meat. Good for her! Then five weeks later, she’s eating a burger and I’m okay with it because I’m happy she committed for the days she did. I’m generally just a glass half full person. I had the same idea about resolutions for myself. I’d rather do a bunch of little things all year than try to commit to something large and maybe, unatameable. Resolving to an adjective to live by instead of a thing to do. 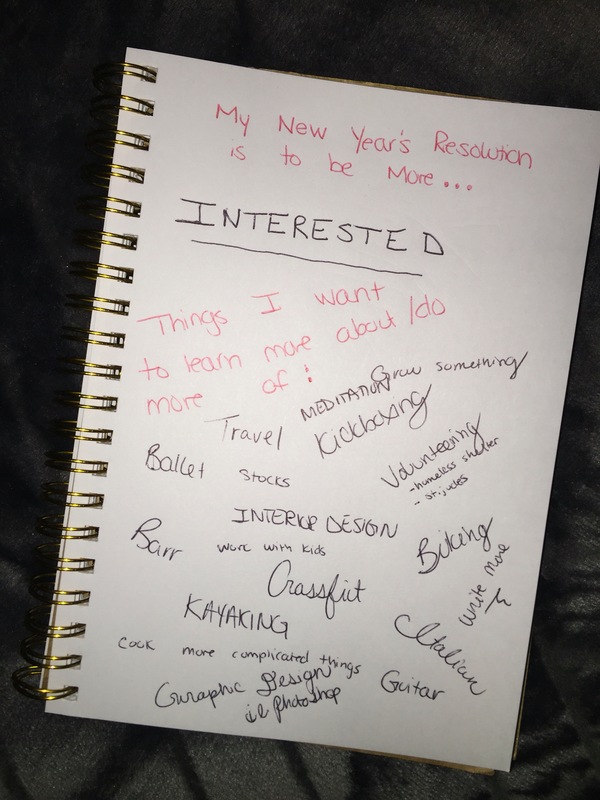 That led me to my 2016 resolution of being more interested. Listening more, researching more, doing more of the things I’ve always wanted to. Sitting on the couch yesterday I doodled just a few of the things I’ll be striving to accomplish in the new year. What will your inspirational word be in 2016? Nice. Love not judging those who dont finish but praising that they have begun! Love that! And u go girl! Yes exactly! What a great way to put it. Thank you so much! Loving the support.